A close friend of the ClassicalRealist.org, Daan Hoeskstra will be offering traditional old school fresco workshops in Mexico. See the details below. Fresco is a technique used for mural painting. Most of the murals painted by Diego Rivera, for example, were done in fresco. The Maya Indians did fresco paintings in the Pre-Columbian era, as did the inhabitants of Pompeii. Now you can learn this ancient technique in a simple, introductory five-day workshop in the beautiful colonial town of Alamos, Sonora. 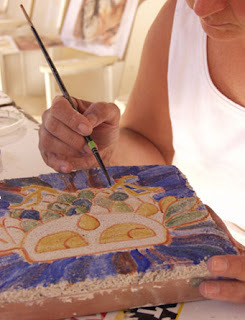 You will learn every step of the fresco process, including preparing the plaster, plastering a fresco panel, how to grind pigments, and which pigments to use. Each student will paint at least one fresco panel on terracotta, the traditional support for practicing fresco technique. Classes are open to students ages 16 and up. One does not need to be an artist to learn and appreciate the process that Rivera and Orozco used. Workshops will be held Monday thru Friday, from 9 AM to 1 PM at the Casa de Cultura, Loma Guadalupe, in Alamos. $250 for the five day workshop, or $125 for Alamos residents. Materials included. Limited to 5 participants per workshop. Proceeds benefit a program to offer workshops to Mexican artists and paint public frescos in Alamos.